This image is a continuation of an image I made in 2014 of the M81/82 galaxy group. I made the images and found signals of integrated flux nebula surrounding the galaxies. Soon after that I got in touch with Neil Fleming who had a splendid image of the IFN in this region on his website and a fellow astrophotographer, Michael van Doorn, who had imaged the galaxies using his hyperstar setup. We decided to combine the data and create a deep field of this region. The lower magnitude visible is around mag. +24 in this image! Because of the long period of bad weather I decided to do some reprocessing on previously made images and decided to see if I could get even more out of this image. I think the result is astonishing. As far as I have found this is the deepest image of this region that I could find on the internet. 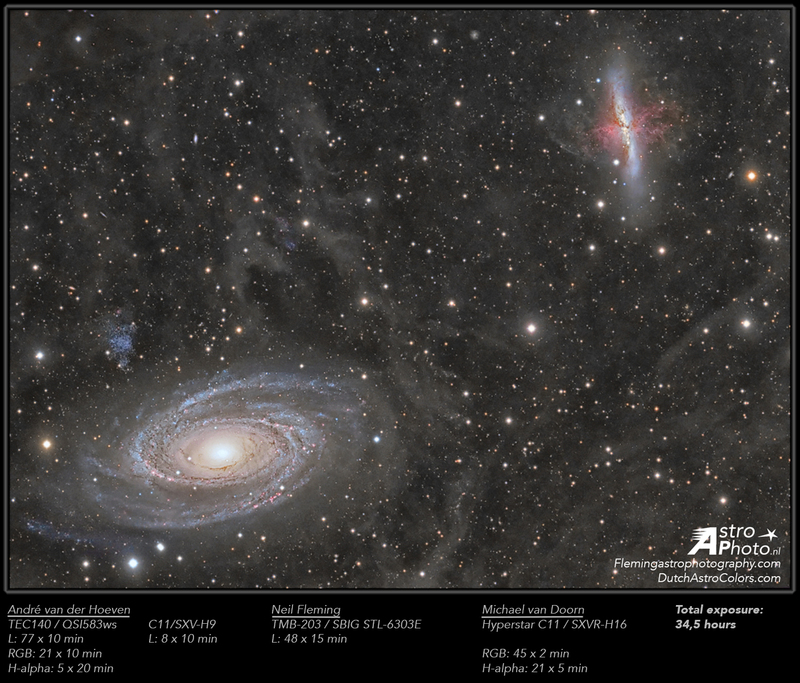 The IFN really stands out very clearly and it’s nice to see details like Arp’s loop at M81 really jumping out to the image…. Image details are visible in the image.